The Elly Ride Hybrid is a beautifully designed touring e-bike that’s full of character. Smooth lines and gorgeous looks typify the Elly Ride Hybrid with a refreshingly stylish design that has huge appeal. With a revised frame for 2018, the Elly now has even easier handling, more reach and greater comfort. It’s lighter and just as strong. An easy entry frame appeals to both men and women alike, with even more room on the 2018 model. This beauty comes with an integrated luggage carrier and the reassurance of CUBE’s impeccable safety and quality standards. Ortlieb panniers for example easily attach on and off. No hassle, no fuss. Most noticeable on the Elly is the lovely colour co-ordination thanks to fawn coloured tyres, grips and saddle. Driven by the new Bosch Active Plus 50Nm motor, the Elly Ride Hybrid glides smoothly, quietly and effortlessly. A huge 500Wh battery sits neatly and unobtrusively on the frame. Being semi-integrated allows improved access for riders. Such an elegant and versatile bike fits seamlessly into either a busy or leisurely lifestyle. Wide-ranging Shimano 9-speed derailleur gears allow even the steepest of hill-climbs. Equally at home on tarmac, canal tow-paths and railway cuttings, the Elly Ride Hybrid is guaranteed to please. It’s Schwalbe Little Ben wide tyres with puncture resistant lining provide the perfect grip in both dry and wet conditions. Powerful Shimano hydraulic disc brakes provide safe and effective braking when required. A highly effective front suspension fork, retro saddle and seat-post ensure ultra comfort on those long and lazy rides. The Elly is designed to be a crowd-pleaser and she does just that! 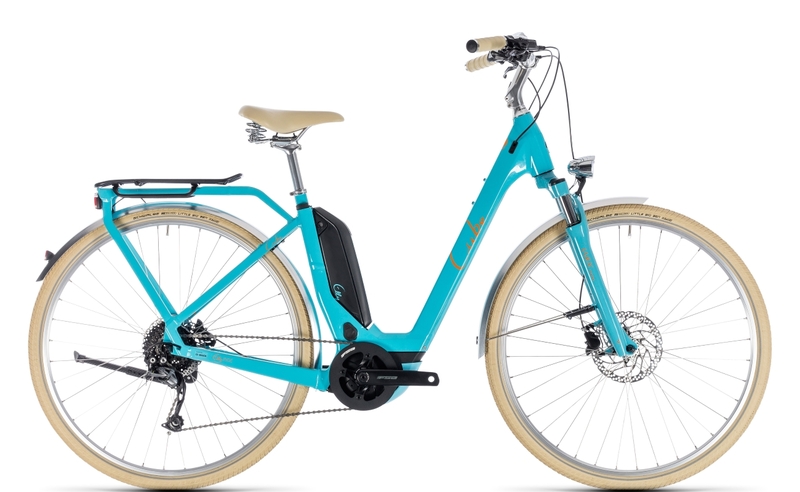 To complete the package, the Elly Ride Hybrid has full mudguards, lights and kickstand as well as internal cable routing. Available in two gorgeous colours and three sizes, the Elly is extremely captivating.